The British Museum Project Display. When I was at KEGS we introduced a Family Learning project as a transition activity. The idea was to reinforce some key messages about learning and to give value to parents supporting their children in the learning process. I wrote about one year’s outcomes in this post. 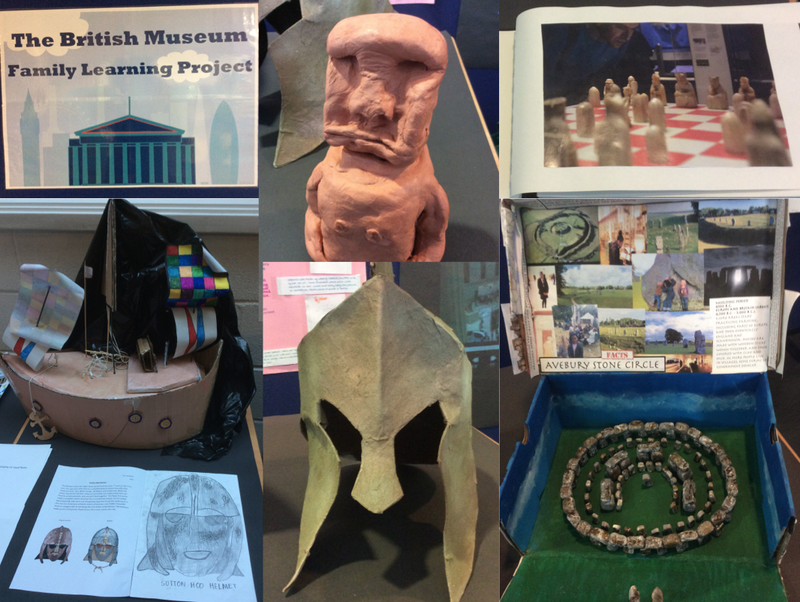 Year 6 students were set the challenge of going to the British Museum with their parents and to do a project; it was very open-ended with some stunning outcomes. I’m keen to do the same at Highbury Grove. This year we trialled it with Year 7s, giving them the task part way through the Autumn term. 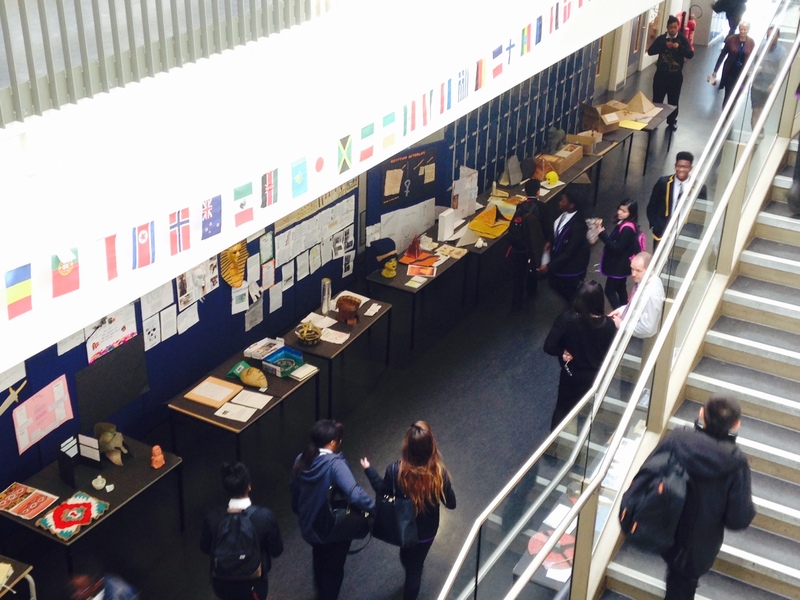 Each tutor did a great job following up with their tutees, encouraging them to go to the museum at weekends and half-terms. We also ran a day trip for students whose parents had not found time to take them. 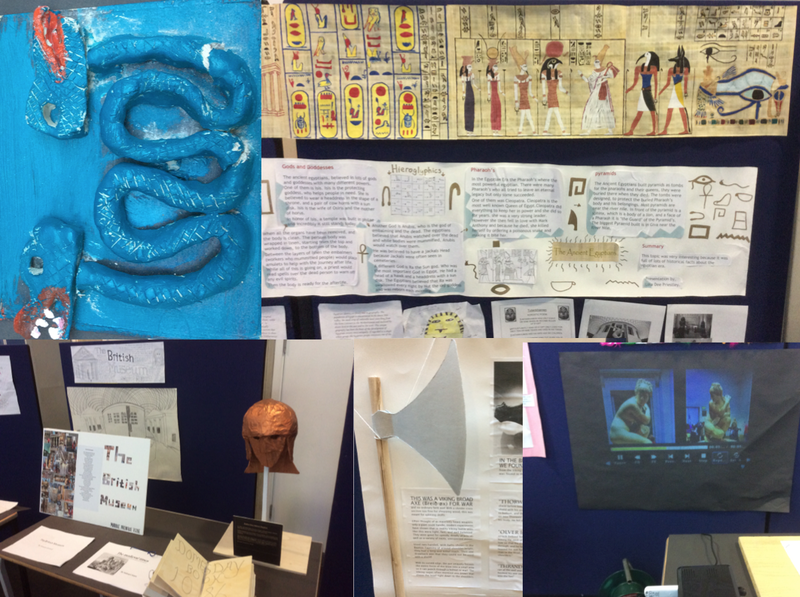 Earlier this week the Year 7 team put on an exhibition of the students’ work. A lot of students opted to make a 3D product; we also had several extensive booklets. As at KEGS, I love the way this project inspired some students to go to town. It become a labour of love – something they got heavily engrossed in and could talk about for hours. It was wonderful to talk to parents who were immensely proud of their child’s endeavours, often marvelling at their level of enthusiasm and their knowledge of their chosen subjects. At the parents’ evening when we put on the exhibition, Year 7 students were chatting away about Vikings, the Rosetta stone, Aztecs and Mesopotamians. Aztecs, Egyptians, Vikings, Greeks…take your pick. The whole point of calling it a Family Learning Project is that families are meant to get involved. I know that I’d leap at the chance to take my kids back to the British Museum if their schools asked me to; I’d help them with their projects if they let me! But that’s not the dominant response. One of the challenges we face at Highbury Grove is getting messages home to everyone and creating the conditions where every family feels as involved as everyone else. For a lot of families, this is quite a big ask. At a rough guess, I think we got about half of the students to produce something – and that was after quite a lot of chasing. The best pieces were absolutely stunning but there was quite a range – as there was at KEGS. More students actually went to the museum but didn’t deliver the final product. In this trial we were deliberately selling this as an opportunity; something to be encouraged and celebrated but not a compulsory task. On that basis, the response was pretty good. Our next challenge is to raise the bar; to make it more of an expectation – a duty almost, for parents to engage. If you can’t or won’t take your child to a museum in six months…? I’m still working on how to finish that sentence. We could also expect greater depth in the responses with perhaps more emphasis on written reports alongside the models and posters. We’ll be kicking this off again next month with our new Year 6s. This time we’ll have some examples to show them to set the standards. I can see it becoming an embedded feature of our transition work. To a great extent, the contents of the British Museum and the range of modes of response encapsulate a great deal of what we’re trying to do at Highbury Grove; developing those ‘philosopher kids’ who are curious, questioning and knowledgable with the confidence to tell us all about it. Three of the best. Reflective journals and hands-on modelling. Tom, this is such a fab idea and we loved doing this with kids when it was their turn at KEGs. I know we are the sort of parents who like to get involved, push their kids (a little!) and don’t need much persuading, but even so were surprised where it took us, what we learned, and how they learn from our example and pick up on our enthusiasm, as we did from them. There was some moaning and groaning but once they started they lapped it up. Particularly memorable was the train journey with Daniel when we’d kinda decided on Sutton Hoe and couldn’t think what form the project would take. I casually suggested a game! He took off then – we spent the whole journey planning how the game would work and all the different elements it could/would contain and helped focus what we needed from our visit to the museum and beyond! I hope KEGs continue with it too – it’s a brilliant bridge up to secondary school. Thanks Caroline. Your family set a standard! Lovely work. I don’t know of they’re keeping it going. Hope the boys are thriving. Thanks – business as usual here still – can’t ask for more really. Did you manage to finish off the sentence “If you can’t or won’t take your child to a museum in six months…? “? Love this idea for engaging transition students.